How many ways do we typically include milk in our diet? And of course milk in our cereal. Milk in protein shakes and smoothies. Basically, it can be in most every meal if we choose. But is it okay for those with kidney disease to have it? But there’s a longer answer (of course there is, Jen). There are several factors that go into deciding the best milk you should have. The first question I have for you is which milk do you prefer? Because if we want to keep something in our diet, we should probably like it. Ammirite? The recommended intake for adults is 1,000 milligrams (mg) of calcium per day. Many people - women especially- are told to even increase calcium in their diet. This is generally recommended for bone strength. Women over 50 years old (and men over 70 years old) are recommended to up their daily calcium to 1,200 mg per day. However, those with kidney disease may find that their calcium recommendations will be different. Some with kidney disease are instructed to increase their calcium in diet while other are told to restrict calcium. How will you know which group you fit in to? 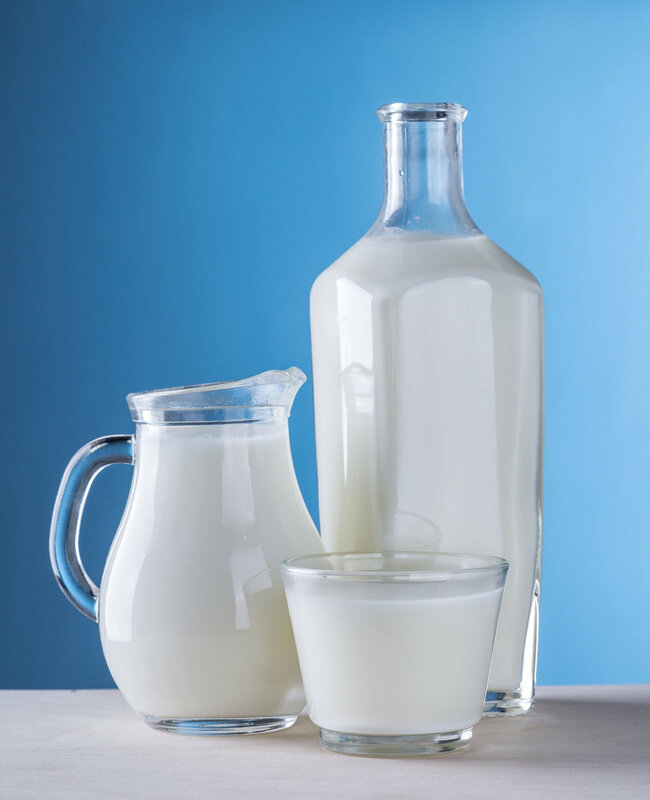 Ask your nephrologist about your calcium balance and if you should focus on or limit calcium-rich foods in your diet. Then, follow up with your dietitian to discuss more details about ensuring you are getting the right amount of calcium in your diet. Wondering which milk you should include with your morning coffee or cereal? Milk is commonly known to be a good source of calcium. A cup (8 ounces) of cow’s milk will give you approximately 316 milligrams of calcium. And even plant-based milks may tout that they are a higher source of calcium when compared to cow’s milk. So how much calcium do you need? Only you and your medical team will know that question. The daily recommended intake for potassium for a healthy adult is 4,700 milligrams per day. Potassium is helpful in muscle contractions - including your heart. While not commonly known for it, milk can be a good source of potassium. A cup of cow’s milk has about 366 milligrams of potassium. It’s not a ton of potassium (for example, a banana has about 425 milligrams; a medium baking potato has about 900 milligrams) but it can add up quickly. Did you know that a high potassium diet can help control blood pressure? This is one of the reasons that a plant-based diet is often encouraged to those with cardiovascular issues. Keep in mind it can only help regulate blood pressure if you’re kidneys are working well. Potassium is generally unrestricted - or even encouraged- to those with early stage kidney disease. As kidney disease progresses into later stages, say 4 and 5, potassium will likely need to be restricted. What stage are you at? Has your nephrologist told you to start limiting potassium in your diet? While there are plenty of other higher sources of potassium, milk can definitely add up! Can you find the inorganic added PHOSphorus in this shelf-stable milk? I’m going to keep this section short and sweet because I really dive into phosphorus in my other blog posts. Have you checked them out yet? Phosphorus found in milk can be either organic or inorganic, depending on if it is naturally found in the milk or if it was added to preserve the milk’s shelf-life. Inorganic (added) phosphorus is best to limit as much as possible. This is very important to limit, especially with kidney disease! How do you know if your milk has inorganic phosphorus? Any ingredient with P-H-O-S is an inorganic phosphorus and will become absorbed into your blood stream almost 100%. An example could look like “PHOSphoric acid.” It’s generally recommended to avoid the inorganic phosphates, especially with kidney disease. Check how different types of milk compare when looking at nutrients highlighted in the kidney disease diet. Find the best one that works for your diet! Please keep in mind that the nutrition information presented here is from examples of the products. Nutritional content will differ between brands and products. Each company and product can have slight differences in the nutritional content so READ THE LABEL! Bottom line: If you want to keep milk in your meal plan, first determine with your nephrologist or primary care doctor what is most important to your health. Then, speak with your dietitian to decide how you can incorporate this creamy, cold beverage into your day. And if you need help figuring out where to start, I’m here for you! Can I Drink Coffee if I Have Kidney Disease?